If this worries you, I’ve got some good news. You’re in good company. The world is filled with extraordinarily successful entrepreneurs who were told that their ideas wouldn’t succeed or that they didn’t have the time, talent, or resources to be successful. You worked as Head of Content at a full-service digital agency before you started your own business. How did you feel about that work, and what prompted you to leave that position to start your own business? Life at a marketing agency is certainly exciting, with plenty of diverse clients and campaigns to work on. The hours were long and the work could be challenging, but I thoroughly enjoyed it. My colleagues were mostly great, and we supported each other through our projects as well as forming firm friendships outside of work. There was fun to be had, too; weekly events, dinners with clients, awards ceremonies and after-work socials allowed us to blow off steam while keeping team morale high. Of course, there were downsides to working in this environment. It’s easy to get lost in the noise of a fast-paced, high pressure agency, and when your department is the smallest in the company, you feel the impact even more. I grew to realize that no matter how loud you shout, it’s often impossible to be heard. After weighing the pros and cons of my current career situation, I knew it was time to go solo. In your initial message to ChooseWhat, you mentioned that when you shared the idea for Naturally Content, “colleagues and friends were skeptical, suggesting that companies are more interested in full-scale marketing strategies that are offered by larger agencies.” What were some of the discouraging comments, and which comments were most difficult to hear and why? When I first announced that I was setting up my own business, I received as many judgments and doubts as I did congratulations. This took me aback, as I never expected that many negative reactions (In my opinion, entrepreneurship is nothing but positive!). There seemed to be a lot of focus on the notion that a client would choose a larger agency over me because it could offer a broader service. Why would a company opt for simple content marketing assistance, when they could get technical SEO, paid search, and traditional media marketing from one dedicated source? These comments frustrated me because I knew there was a gap in the market for a content-specific service, focusing purely on marketing businesses through creative content solutions. There were also snide comments about me being “brave.” This still makes me laugh—because content marketing is such a dangerous business, right? And there was a rather nasty dig about the “luxury” of leaving full-time work and becoming self-employed. The truth was, it wasn’t a luxury at all. I had saved frantically for several months, ensuring that I had enough money in the bank to tide me over, just in case my plan didn’t work out. I had more sleepless nights than I can count; and to this day, not a day goes by that I don’t worry about finances, deadlines, and the future of my business. Knowing that I proved people wrong does bring me comfort, though! The busyness that followed my announcement was a blessing in disguise. I had so much to think about that it was quite easy to push the discouragement and doubts to the back of my mind. I’m usually a very sensitive person, but since I was in the middle of launching a business, I simply didn’t have the time to lament over the negativity of others. I pushed forward with my plans and focused on my end goal, and by the time the craziness of Naturally Content’s first months had subsided, I was able to reflect on the naysayers with a smile on my face—I’d proved them wrong without even thinking about it. Without sounding like a cliché, I genuinely believe that it was meant to be. 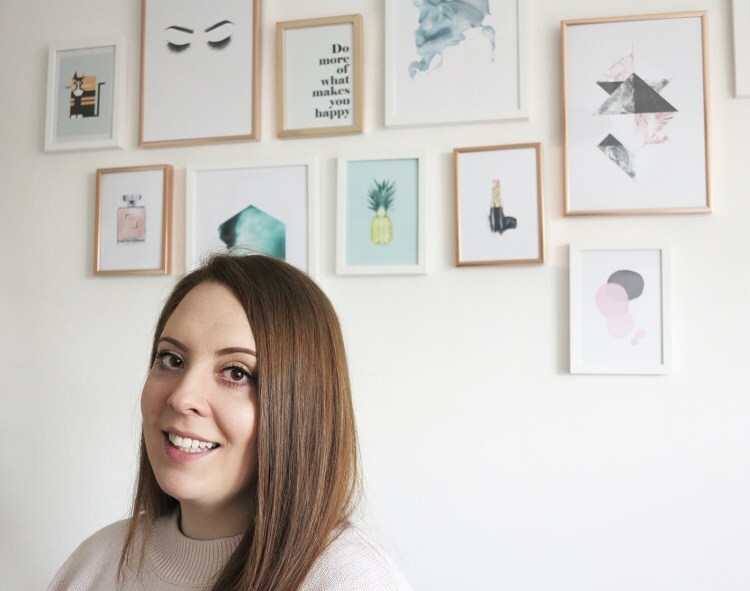 I’d been toying with the idea of becoming self-employed for a while, and when I finally plucked up the courage to do it, my first freelance opportunity rolled in from an old friend. The project was a considerable size for my first one, and after calculating how many hours this would take and how much I would charge, I realized the financial benefits of becoming my own boss! This gave me the final push to speak with my boss and tell him my news. I worked a three-week notice period following my resignation, and I didn’t start working on my first Naturally Content project until I was officially self-employed. I wanted to focus purely on completing my role before leaving, and it didn’t seem fair to be moonlighting at a company that had treated me so well. Your web site is gorgeous with clean, crisp copy and design. Tell me a little more about Naturally Content and how you came up with the idea and branding for the business. Thank you so much! I’d come up with the idea of ‘Naturally’ way before I decided to take the plunge and set up my business officially. I was always telling my clients that the best way to approach content marketing was through honest, authentic, natural methods – not paying for backlinks, buying social media followers or sending spammy emails (which a lot of them wanted to do!) The concept of natural content then developed into “Naturally Content,” and I loved the additional connotations of being effortlessly happy and contented—naturally content. For me, “Naturally Content” isn’t just the name of my business, but the way it changed my mindset. No longer am I stressed-out, uptight, and busy; instead, I’m positive, motivated and inspired (and still busy… but in the very best way!) I’m doing a job that brings me joy every single day. In terms of the look and feel of Naturally Content, I wanted to keep things fresh and simple, with a feminine twist. I initially leaned towards a more green-toned scheme, but I realized I might run the risk of looking like a health food brand! Instead, I opted for my favorite shade of turquoise—a lovely mix of fresh, natural green and ‘social media’ blue (It works for Twitter, LinkedIn, and Facebook, after all!). I keep my imagery crisp and simple, too, with plenty of clean shapes and white space – my Instagram account is a good example of this: @NaturallyContent. My main typeface is Coneria, an attractive script with natural loops and lines, and I coordinate this with a basic sans-serif font, Source Sans Pro. I love hearing about your thought process! How do you feel about the decision to launch your own business now? Why? Starting my own business is hands-down the best decision I’ve ever made. I get such a buzz when I look back at my achievements over the last two years, and every time I feel a little worried or stressed, I just have to remind myself of how far I’ve come. I feel such a strong sense of pride. That’s not to say that I don’t still have the occasional ‘what-if’ pop into my mind. What if I’d got a job at a different company instead of going solo? What if I worked my way up to a top spot there? What if I had that nice secure salary and other company benefits? Would I be better off? Would I be happier? It’s totally normal to have these thoughts, and there is nothing wrong with contemplating the ‘what-if’ scenarios. But after I’ve had my moment, I revert straight back to reality and enjoy the view—I’m 27 years old and I’m running my own business. What’s to regret? I have three key pieces of advice for those that want to follow their dreams but are facing doubters, haters, and cynics: First, make sure this is the right path for you. Don’t make snap decisions. Conduct your research, discuss it with people you trust, and then get plans in place for all possible scenarios, including savings and alternative solutions. If you’ve made solid plans, you can rest assured that everything will be okay, no matter what the doubters say. Secondly, keep focus. There will always be someone wanting to burst your bubble, but at this moment in time, you have much bigger things to think about! If discouraging comments or snide remarks are getting to you, use them as fuel for your fire. You think I’m being impulsive and idealistic? You think my idea is flawed and I won’t succeed? You think I’d be better off sticking out a job that offers security, but doesn’t make me genuinely happy? OK—great. Watch me prove you wrong. And finally, remember that negative comments from others do not require reactions from you. Of course, if someone is showing genuine interest and wants to enter into a constructive conversation about your plans, offering their own thoughts and opinions, then that’s a different story. But if a person is offering you nothing but doubt and discouragement, then just nod, smile, and forget about it. You do not have to defend your ideas or validate your decisions!